Perfect onderhouden met moderne uitstraling ingerichte Monterey met grote kuip met extra groot zwemplateau. Twee Volvo D3 motoren van 160 PK zorgen voor formidabele prestaties (maximaal 65 km/uur!). Ruime kombuis en een grote U-vormige dinette zorgen samen met de ruime slaapkamer voor veel comfort aan boord en een fantastische vaarvakantie. Inruil speedboot bespreekbaar. 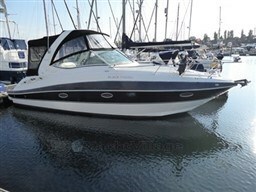 Dear Sirs, I have seen on YachtVillage your offer about Monterey Boats Monterey 298 Sc - 2006 (code: 251828). I am interested in the offer and would like you to contact me. Thank you. If you would like to find out more about this boat and any other boats of this type and range, Digibusiness Srl,the Company that manages YachtVillage, and Smits Jachtmakelaardij, the Company that exhibits the Boat, must necessarily acquire some simple details about you (name, surname, email address and, if needed, your telephone number). These details will be processed according to the purposes and means of the processing indicated in the privacy statement under the PRIVACY Section of this website, referred to herein.